Yu-Gi-Oh! 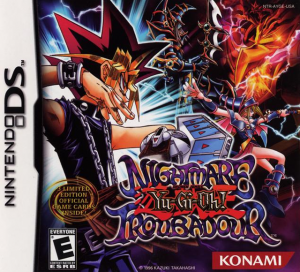 : Nightmare Troubadour is a Nintendo DS game from Konami based on its popular Yu-Gi-Oh! franchise. The popular cartoon and card game revolves around decks of collectible cards featuring all manners of monsters. The game appears to just be a DS-skewed interpretation of a board game-style experience. 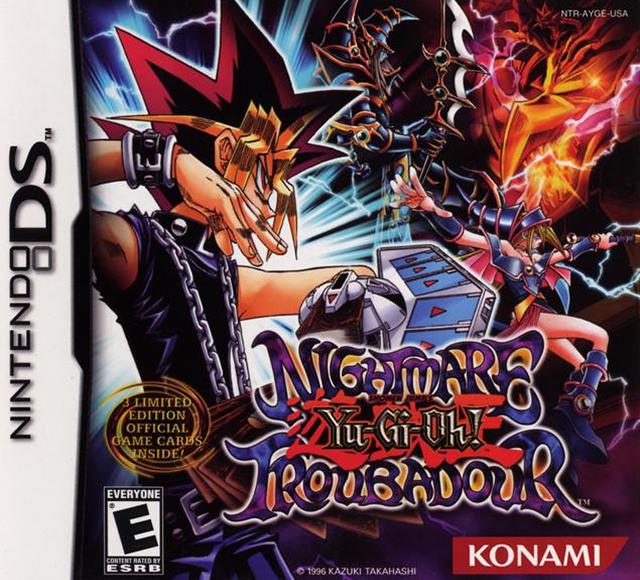 Nightmare Troubadour will be the debut Yu-Gi-Oh! card game on the DS system. When you get far enough through the game you’ll eventually recieve e-mails that talk about a secret passwords, and they tell you them. These passwords DO NOT require 1000 KC to use. You must progress through the game until you get the Marik. After you duel him a lot, and if you have either Slifer or Obelisk in your trunk, he will ask to trade you for his Ra. Beat the Expert Cup finals to be able to use this in the KC store. 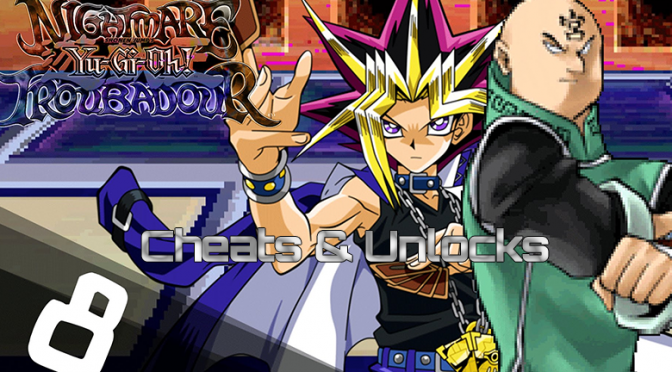 You must have your GBA Yugioh game named Yu-Gi-Oh!GX Duel Academy inserted into the GBA Slot of your Nintendo DS. Start up your Yu-Gi-Oh! Nightmare Troubadour and you shall get 3 wing Koriboh cards. The card that Jaden Yuki uses in the tv show. During the expert tournament, if the player who’s view is yours loses (Joey or Yugi), it counts as a loss on your own record. Even though the text of the card states the fiend monster with 500 or less atk has to be destroyed in battle, and it sends 10 cards from the opponent’s deck to the graveyard. The actual effect the computer uses is tributing 1 dark monster of 1000 atk or less, then for 3 turns any monster with 1500 atk or higher on your side of the field, hand and draws are destroyed. Totally different from the text it displays in the game. Two cards were mixed up with their effects: Blast with Chain & Kunai with Chain. Both of them increase a monster’s attack by 500, but Kunai with chain can place an attack position monster in defense mode, and Blast with Chain can destroy a card on the field if it is destroyed by an opponent’s card effect. If you have Blast with Chain face down on the field, and activate it you may notice that sometimes it comes up with a screen that says place a monster in defense position, increase attack, or both effects. If you ever encounter this problem always select increase attack, otherwise the effect will not activate. If you’ve ever gotten the card: Blue Medicine, the card’s effect on the game says that it will recover both you AND your opponent’s Life Points. But when you activate it, it only heals YOUR Life Points. So now you can use it without the fear of regaining your opponent’s Life Points. If you are playing the U.S. version of the game, Pegasus will no longer appear after defeating Odion due to a bug in the game, so get his deck recipe and trade cards with him before he leaves or you’ll be stuck with an incomplete file. When you go into the card shop, there is a password machine. In order to use this you must have 3 things: 1. completed expert tournament 2. 1000 KC 3. already have the card you desire (the machine can only be used on cards that you already have). Now that you have these 3 things, you ask, “Where do I get the passwords?” The answer is simple. It’s on real yugioh cards, on the bottom left corner. Simply Enter these codes and you will receive the card you desire. NOTE: YOU CAN ONLY USE EACH CODE ONCE, AND SOME CARDS DON’T HAVE CODES!